The Belgian surrealist movement, like its contemporary French cousin, included both visual artists--Ren Magritte most famously--and writers, who were also its theorists. They shared with the Parisians a fierce commitment to personal, political and aesthetic liberty, and to humor, surprise and transgression as artistic strategies, but they parted company when it came to the unconscious and the occult. Ideas Have No Smell gathers exemplary works by three literary lights of Belgian surrealism: Transfigured Publicity, a visual text of early concrete poetry by poet and photographer Paul Noug (1895-1967), the apostle of appropriation; the whimsical, hand-drawn artist's book Abstractive Treatise on Obeuse by Paul Colinet (1898-1957); and For Balthazar, a collection of aphorisms and observations by the ever skeptical author, lawyer and anarchist Louis Scutenaire (1905-87). 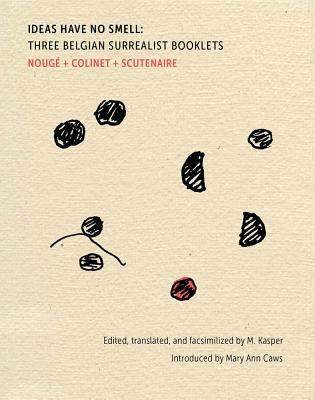 In addition to the booklets presented in a facsimile-style translation by M. Kasper, this letterpressed slipcase includes an introduction by scholar Mary Ann Caws and a poster of an anonymously handwritten panneau of Noug 's visual poems, possibly coauthored with Magritte and previously reproduced only in Marcel Mari n's documentary history, L'Activit surr aliste en Belgique.